Anyway, because I’m obsessed with food, I do a lot of grocery shopping — this, however, leads to me having an over-stuffed fridge a lot of the time, and then I’ll have to challenge myself to figure out new ways to use different ingredients together so that nothing goes bad. (Since I’ve moved into this apartment, I’ve thrown out one carrot because it went bad — and I moved in in May!) Every once in a while, I’ll tell myself, “Dear self. You may not go buy groceries for a full week.” and I’ll try and stretch out the groceries I do have to make it all last. If you’re down for some interesting combinations (cilantro, tomato, eggplant, alfalfa sprout and hummus wraps, anyone?) — I suggest you give it a go. And that’s how this simple recipe (you’ll soon learn that all of my recipes are simple. I am not a complex gal. I like to sing along to Dan Mangan and perhaps even do a little shimmy while cooking – and so, if I want to keep all my fingertips attached and my food edible, the meals I make all need to be super easy) was made. Yields 2 servings for not-so-hungry folks, 1 serving if you’re running on an empty stomach. Takes 25 minutes, including prep. 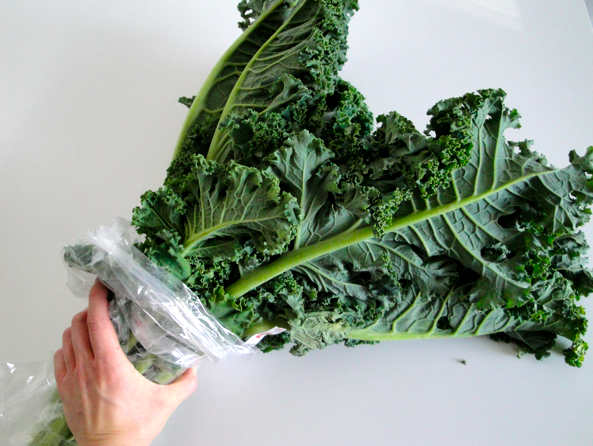 Prepare the kale by removing the stems (I literally just rip the leafy parts off of the stems – no need to worry about cutting them out with a knife). Rinse with cool water, pat dry with some paper towel, then throw it in a bowl and drizzle with a little bit of olive oil and sprinkle on some salt. 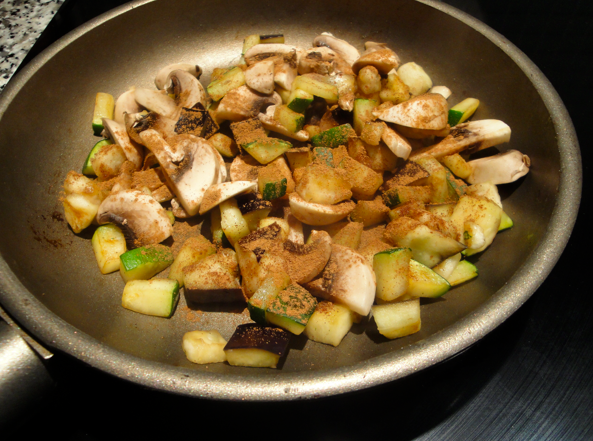 Add some oil to a pan that’s on medium-high heat and add the zucchini first. Cook it for a bit to let it soften, then add the eggplant. About two or three minutes after you’ve added the eggplant, add the mushrooms, cook for one minute, then sprinkle on the cinnamon. Turn up the heat under the pan. Drain any excess liquid from the diced tomato, then throw it into the pan. Splash in the red wine. Let it sizzle for a minute, then add in the egg and kale — what happens is magical: the sticky egg kind of ‘glues’ everything to the kale, and if the heat is high enough, you can cook the egg and the kale will still be slightly crunchy — creating a fantastic combination of flavours. Remove from heat depending on how moist you’d like the dish to be — the longer you keep it on the heat, the more juices will leak out of the mushrooms and tomatoes. Once the egg is cooked, it’s up to you. Serve with a slice or two of crusty bread. 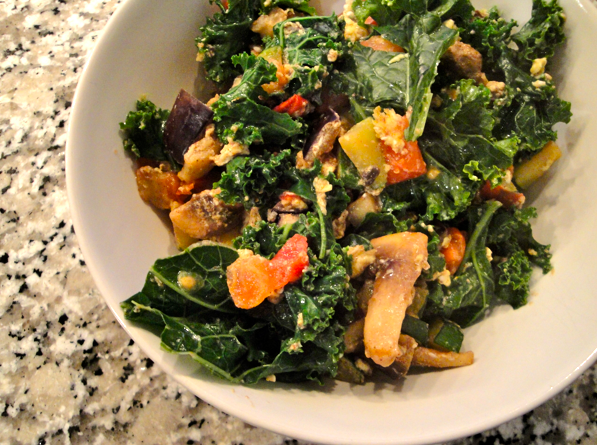 Delicious and filling, this dish is really one of those super adaptable ‘I-need-to-clean-my-frige-out’ type of meals. It’s super simple – but hey, food doesn’t have to be complicated to be pleasing. Enjoy!